Infants usually respond differently to a neuromuscular relaxant compared to children or adults. Isoflurane is commonly used as an anesthetic gas in infants. In an RCT design, we investigated whether a dose of mivacurium 250 μg/kg results in faster onset of action than 200 μg/kg in infants under isoflurane anesthesia. Spontaneous recovery times and cardiovascular response were also evaluated. Twenty-four low surgical risk children, aged 6–24 months, undergoing an elective surgery and requiring tracheal intubation were selected. After anesthetic induction, patients randomly received an iv bolus dose of mivacurium 200 or 250 μg/kg. After maximal relaxation, the patient was intubated. Isoflurane was administered to maintain anesthetic level during the surgical procedure. Neuromuscular function was monitored by accelerometry (TOF-Guard) at the adductor pollicies. The first twitch (T) of the TOF and the T4/T1 were measured. The time-course of heart rate and systolic and diastolic blood pressure were analysed by transforming them into their respective areas under the curve. Mivacurium 250 μg/kg produced a maximal T block faster than 200 μg/kg, i.e. 2.4 ± 1.1 vs. 3.5 ± 1.4 min (p < 0.05). Spontaneous recovery times were similar in both groups. Heart rate was similar between doses while systolic and diastolic blood pressures were lower with the higher dose (p < 0.05). Flushing was observed in two cases, one in each group. The maximal effect of mivacurium 250 μg/kg, in infants under isoflurane anesthesia, was present one minute faster than 200 μg/kg. However, it produced a significant cardiovascular response. Mivacurium is a short acting benzylisoquinoline non-depolarizing neuromuscular blocking agent, with a demonstrated safety and efficacy both in children and adults [1–3]. It has been in clinical use for a long time and the clinical pharmacology has been widely documented. In children, administration of isoflurane previous to and during the effect of vecuronium or mivacurium increases their spontaneous recovery times in a time-dependent manner [4, 5]. However, these times are not modified if the anesthetic gas is administered after the peak effect of the neuromuscular relaxant is produced . Furthermore, despite infants usually respond differently to the effects of a neuromuscular relaxant from children or adults do, and that isoflurane is commonly used in children including infants, only few studies have evaluated the effect of mivacurium during isoflurane anesthesia [4, 7, 8]. In the current study, we compared the effect of 200 and 250 μg/kg of mivacurium in infants during isoflurane anesthesia in order to investigate whether the higher dose resulted in a faster onset of action. Spontaneous recovery times and cardiovascular response to the neuromuscular relaxant were also compared. where K= 10.5 based on tables of the standard normal curve at an α level of 0.05 and β level of 0.10 for a two-sided test, σ2= 0.302 min is the expected variance according to the standard deviation observed in 15 previous studies (range 0.06 to 1.26 min) administrating mivacurium in children under different clinical conditions, Δ2 = 12 min. Equation resulted in a sampling size of 1.9 patients in each group, we therefore arbitrarily increased the sample size to 12 subjects in each group that could satisfy the minimum significant difference of 1 min between two means associated to a standard deviation of 0.70 min. Flow chart of the progress of the study throughout the phases of a randomized trial, i.e. enrollment, intervention allocation, follow-up and data analysis. Procedures, previously used for other study , were as the following: on arrival at the operating room, children were cardiovascular monitored, i.e. ECG, pulse oxymetry and non-invasive blood pressure by means of an automatic device. Anesthesia was induced using atropine (20 μg/kg), fentanyl (2 μg/kg) and propofol (3 mg/kg). Normocapnia and normal body temperature were maintained intra-operatively. After induction of anesthesia, children were ventilated with 100%-oxygen. Thereafter, using surgical tape, the acceleration transducer of a TOF-Guard neuromuscular transmission monitor (manufactured by Biometer International A/S, Odense, Denmark) was attached to the flexor aspect of the freely mobile thumb. The two cutaneous electrodes to stimulate the ulnar nerve were fixed to the anterior forearm just proximal to the wrist joint. The TOF-Guard was programmed to automatically deliver supramaximal train-of-four stimuli to the ulnar nerve in two phases. During the first, the stimuli were programmed to be delivered every 15 s from baseline to 5 min. Thereafter, the stimuli were delivered every minute until complete recovery (T ≥ 95%) was observed, and the stimuli sequence was stopped by the operator. Mivacurium (commercialized in our country until 1999 by Glaxo-Wellcome de México, Mexico City, Mexico) was administered as a bolus dose into the T-connector of a rapidly running intravenous infusion. The TOF-Guard was calibrated by using its automatic start-up procedure, and the programmed sequence was started immediately before mivacurium administration. The T (%) and (T4/T1) of the TOF response were simultaneously measured. 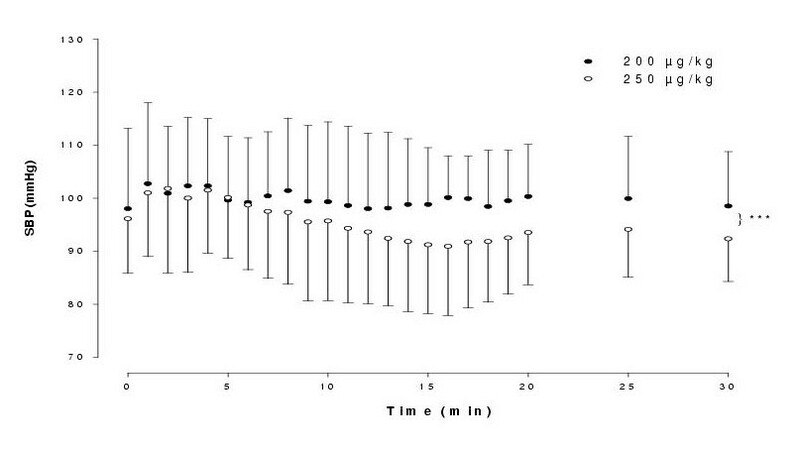 Time consumed from induction of anesthesia until mivacurium administration was 3 to 5 min. Finally, intubation was attempted in all infants when either T= 0% or T <25% with no changes during a one-minute period together with the presence of clinical satisfactory conditions for tracheal intubation were present. Clinical condition was evaluated by other of the authors also blinded for patient allocation group, by using the scale described by Fahey et al. .
After intubation and throughout a period of time not longer than 3 minutes, administration of isoflurane in oxygen was initiated and slowly increased until a dose of 1.5–2.0 MAC end-tidal adjusted for age was reached. A flow rate of 4 L/min of oxygen was administered through a semiopen Bain circuit and an end-tidal carbon dioxide tension was maintained between 32 and 38 mmHg. At ages of patients studied herein, one unit of MAC of isoflurane is equivalent to 1.6% . End-tidal concentration of isoflurane was kept stable until the endpoint of neuromuscular monitoring had been attained (T ≥ 95%) in every patient. At the end of the surgical procedure, administration of the anesthetic gas was slowly discontinued, during a process of 5 to 10 minutes, until patient presented clinical conditions to be extubated. Oxygen administration was maintained until a complete clinical recovery was observed and patient was able to self maintain the ventilatory function. No additional drug was required during the anesthetic procedure. Information was recovered and captured in a printed data collection form. This process was performed by one of the authors ignoring the dose of mivacurium. Thereafter, data were transferred to an electronic form (Microsoft® Excel 97). Computation of the onset and spontaneous recovery times and statistical analysis were performed by a blinded process. For analysis of the effect, the neuromuscular response was divided in two phases. Response from the baseline until the maximal relaxation was observed and maintained was used to compute the times to a block of 90 (OA90) and 99.9% (OA100). Second, response starting with the maximal relaxation until it returned to baseline values was used to obtain the times to spontaneous recovery of 10, 25, 50, 75 and 90% of the neuromuscular function. To obtain these parameters, both T and T4/T1 responses were analyzed. where Y represents HR, SBP or DBP, the X is the time at which Y was measured, and 1,2...n are the progressive values until the last observation was performed. By using this equation, the overall response of HR, SBP and DBP is obtained and compared between groups, avoiding the time-by-time comparisons. Finally, the onset of action was considered as the primary outcome of the study while spontaneous recovery times and cardiovascular response as secondary outcomes. All data were presented as mean ± SD, ranges and when indicated the 95% confidence intervals for the difference for parametric data were computed. The Student t test was used to compare age and weight between the two groups of treatment, while the Fisher exact test was used for comparison of gender. The quality of fit of the pharmacodynamic (sigmoidal) model to the data was judged by correlation coefficient of observed to predicted effect automatically computed by SigmaPlot®. Visual examination of plots of the ratio of observed to predicted response and plots of observed minus predicted response in function of time was also performed, considering a good agreement between observed and predicted response when ratios approached 1 and differences approached 0. The times to OA and to spontaneous recovery of neuromuscular function were also compared between groups by the unpaired Student t test. The unpaired Student t test was also used to compare each AUC, i.e. AUC-HR, AUC-SBP and AUC-DBP, between groups. In every group, the HR and SBP and DBP data obtained 5 min after mivacurium was administered were compared to their respective baseline values by means of the paired Student t test. In order to evaluate the effect of age and weight into onset and recovery times (data from all children), a single linear regression analysis (y= mx+b) was performed between each of the onset and recovery times as the dependent or explained variable and age or weight as the independent variable. Finally, descriptive statistics, paired and unpaired Student t test and linear regression analysis were performed using the software WinSTAT (R. Fitch Software, Cambridge, MA, USA) for Microsoft® Excel. A two-tailed probability of p < 0.05 was considered significant in every test or analysis. The two groups were similar in demographic data including gender, age and weight (Table 1), reflecting a successful randomized procedure. All patients reached the maximal (100%) relaxation response and received a Fahey scale 0 for tracheal intubation, and were extubated and discharged from the operating room with a full recovery of the neuromuscular function (T ≥ 95%) and without any complication of drug administration. All infants completed the study and data were analyzed in the group they were randomized (Figure 1). Responses from all patients were successfully modeled. This was proved by regression coefficients always greater than 96%, by plots of ratio of observed to predicted response in function of time approaching 1, and plots of observed minus predicted response in function of time approaching 0. The times to OA and to spontaneous recovery of T and T4/T1 of the two groups were summarized in Tables 2 and 3, respectively. 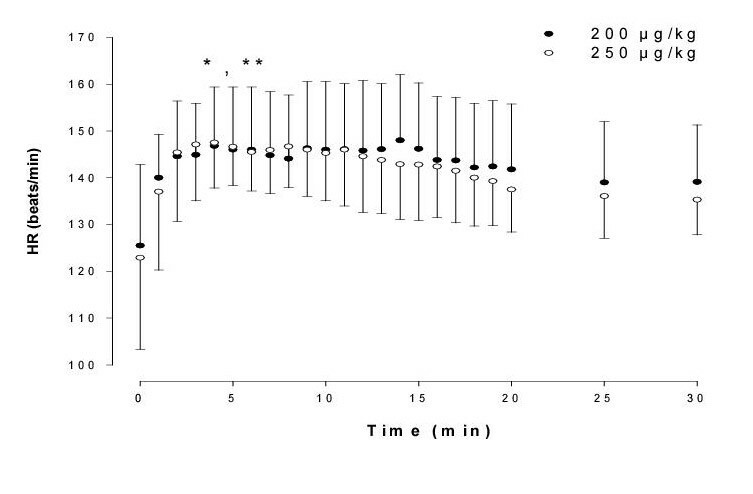 In relation to T response (Table 2), the maximal block with mivacurium 250 μg/kg appeared one minute faster than 200 μg/kg (p < 0.05), whereas spontaneous recovery times were similar between groups. However, analyzing T4/T1 response, similar times to OA and to spontaneous recovery were obtained with both doses (Table 3). Additionally, no relationship between age or weight and any of the OA or spontaneous recovery times was demonstrated by linear regression analysis. In relation to the cardiovascular response, the AUC-HR was similar in the two groups (p > 0.05) while both AUC-SBP and AUC-DBP were significantly lower (p < 0.05) in patients receiving 250 μg/kg. The HR at 5 min after any dose of mivacurium was administered significantly increased in relation to baseline values (p < 0.05), while a similar time-course of the HR was observed with the two doses of mivacurium (Figure 2). The time-course of both SBP (Figure 3) and DBP (Figure 4) reflected the differences observed in their respective AUC's. Transient flushing was observed in two cases: one female patient, weighing 13 kg, aged 22 mo., and receiving mivacurium 200 μg/kg, and one male patient, weighing 8.3 kg, aged 8 mo., and receiving mivacurium 250 μg/kg. In this study patients underwent muscle relaxation with mivacurium. Anesthesia was intravenously induced and maintained with isoflurane administered when relaxation had reached a maximal response. The same clinical model was previously used to evaluate the effects of rocuronium , and clearly differs from other studies. Mainly, intubation followed by gas administration was performed after a maximum neuromuscular block was present, avoiding any effect of the anesthetic gas on the times to OA. However, isoflurane is able to increase twice the spontaneous recovery of vecuronium in children, and prolongs recovery times for more than 50% after 30 min of its administration [4, 5]. In the present study similar spontaneous recovery was observed in the two groups, and our results are comparable to 15–20 min for T90 of Goudsouzian's review article . Furthermore, our T25 values are longer than those obtained with 300 μg/kg of mivacurium under nitrous oxide-halothane or nitrous oxide-opioid anesthesia . These considerations suggest that isoflurane does affect the spontaneous recovery similar to or higher than other anesthetic techniques. The duration of action of some non-depolarizing neuromuscular blocking agents differs with age, even when administered in equipotent doses . Other studies have also demonstrated age differences of response to mivacurium [4, 7, 14, 17, 18]. In the current study, we obtained no significant relationship between age or weight and any of the OA or spontaneous recovery. The range of 6 to 24 months of our patients could be broad to study the effect of age in 24 patients. However, a Canadian group of pediatric anesthesiologists found similar neuromuscular effects of mivacurium in patients aged between 2 mo. to 10 yr. [19, 20], supporting our results. Additionally, extremely wide ranges of neuromuscular response in children have been described for other neuromuscular blocking, e.g. T75 ranged from 27.3 to 91.4 min with rocuronium 800 μg/kg and T25–75 ranged from 6.0–22.8 min with rocuronium 600 μg/kg [6, 21]. In relation to mivacurium, cholinesterase activity level is a major determinant of the spontaneous recovery of mivacurium in pediatric population [8, 22]. We did not quantify enzyme levels and therefore the inter-individual variations of spontaneous recovery times are difficult to be interpreted. However, coefficient of variations of T response to mivacurium varied from 14.8 to 45.8% and T75 response ranged from 8.9 to 20 min, representing a less markedly variation than rocuronium. Furthermore, an atypical response was not present in any patient. Therefore, we considered that our patients were a population without marked differences in plasmatic cholinesterase activity. 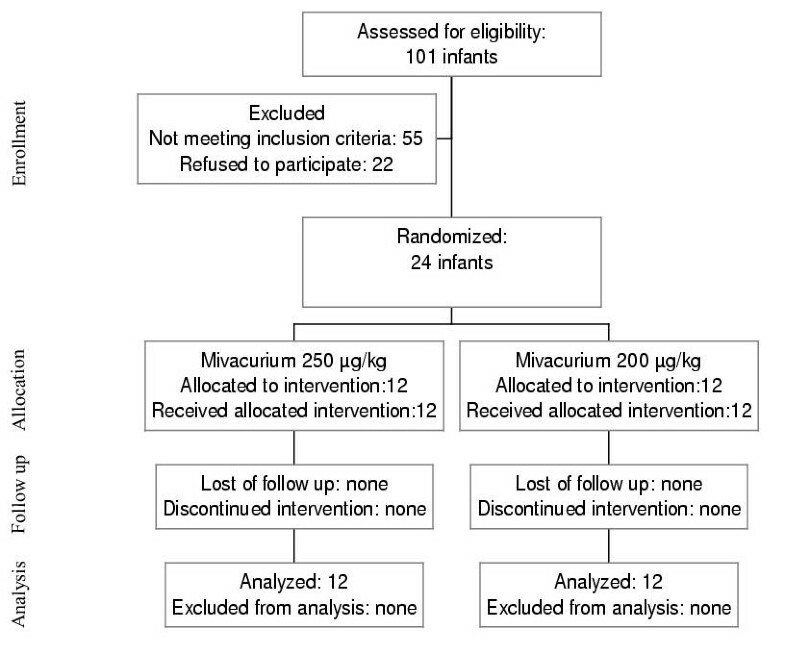 In relation to cardiovascular response, administration of mivacurium 200 to 300 μg/kg in infants and children has demonstrated minor changes or lack of significant changes in HR and blood pressure [14, 18, 19, 23, 24]. We observed an increment in HR at the first minute, reaching the top at 5 min in both groups. Agents having varying cardiovascular effects were administered in addition to and preceding the mivacurium, when assessing the cardiovascular response. Atropine administration and combination of fentanyl and propofol could certainly have an effect on heart rate and blood pressure in our patients. However, a drop in blood pressures indicated by lower AUC-SBP and AUC-DBP of patients receiving mivacurium 250 μg/kg was significant. The review article of Goudsouzian states that reported ED95 of mivacurium for infants ranges from 65–94 μg/kg . The dose of 200 μg/kg will then be2 to 3 times the referenced ED95, and 250 will be 2.5 to approximately 4 times. We therefore considered that these changes could be mainly related to histamine release with both doses, probably more marked with the highest dose. Fortunately, in most cases the histamine release and cardiovascular changes have lacked clinical significance . The TOF-Guard was used to evaluate the neuromuscular response. Some studies have supported its use by finding that acceleromyography compares closely with other more sophisticated equipment [26, 27], whereas clinical trials using the TOF-Guard to measure neuromuscular function have been increased. However, it is not yet accepted as a monitor of definitive studies of neuromuscular blocking agents in anesthesia probably because it does not register the neuromuscular function in a continuous fashion, and can generate "noise" in the measurement of the effect . Previously, we utilized it to evaluate the pharmacodynamics of rocuronium [6, 28]. When used for rocuronium, data acquisition every 5 min in the recovery period was enough to model the recovery phase. Because of a fast recovery after mivacurium administration, data acquisition in the recovery phase was now performed every minute and the effect was also successfully modeled, and results agreed with those previously published in the literature. We therefore considered that, if any, the noise generated by TOF-Guard measurements did not affect data modeling nor results and conclusions of the current study. Unfortunately and despite its relative low cost, capacity to retain data sets and its easy-to-use, TOF-Guard is worldwide no longer commercially available. It is being replaced by the manufacturer company with equivalent equipment named the TOF-Watch series (written personal communication from Biometer International A/S, Odense, Denmark, 1999), unable to retain data and therefore require to be connected into a computer. Finally, we simultaneously registered T and T4/T1. It has been proposed that the T4/T1 is more sensitive than evaluation of any single twitch of the TOF response [29, 30], and does not need an established control. By evaluating the T response, significantly faster OA times were identified with mivacurium 250 μg/kg, while all the T1/T4 were similar between the two groups. This controversy deserves further investigation. The maximal effect of mivacurium 250 μg/kg was produced one minute faster than 200 μg/kg. However, it was associated to a significant cardiovascular response. We therefore conclude that the higher dose does not offer a satisfactory clinical advantage over the lower dose in infants under general anesthesia with isoflurane. The study was supported by grants 30591-M of the SEP-CONACYT and FP0038/988 of the Fondo de Fomento a la Investigación of the Instituto Mexicano del Seguro Social. No supported in any form from any pharmaceutical company. Dr. AA Nava-Ocampo thanks the grant received, as a member, from the Sistema Nacional de Investigadores. All the authors express their gratitude to Drs. A. Baraka and BW Brandom for comments expressed as reviewers of this journal that substantially improved the quality of the paper. Mr. Victor Manuel Vázquez is also thanked for his helpful and patient assistance to prepare the manuscript in English language.